2010 HOLIDAY GIFT GUIDE AND GIVEAWAY - Rock N Learn Phonics Volume 1 And 2 - Mom Knows It All. Rock ‘N Learn programs are designed to enable parents to be as involved as they choose with their kids. Easy to use and follow, each program is crafted especially to allow for self-instruction, especially appreciated by busy parents and teachers. Completely kid-friendly, Rock ‘N Learn is expressly developed to empower kids to learn on their own—or parents can help further apply the material that kids have learned. Because Rock ‘N Learn is all about effectiveness—and simplicity—the programs are designed to provide an alternative to the complicated kits and workbooks that demand a lot of adult supervision. Rock ‘N Learn is education with a beat—and the ‘rock’ behind the ‘learn’ is meant for much more than foot-tapping. Rock and rap music are both very rhythmic; the steady beat helps encourage memorization. The music and video of Rock ‘N Learn work together to involve all the senses: auditory, visual and even kinesthetic (feeling the beat and moving to rhythm). Busy parents and teachers love the way Rock ‘N Learn Phonics captures kids’ attention. Cool songs and humorous characters take the struggle out of learning to read. Students control the pace, advancing as they master each new skill, so they can practice on their own and feel proud of their accomplishments. Learners spend as much time as they need on each section before going to new sections. They can always review previous material; it’s fun with this highly-entertaining phonics DVD. Students learn phonics rules through fun songs and word families. Next, they practice their skills by reading simple phrases using words that rhyme. When ready, students apply the skills they have learned to read complete sentences and stories. The read-along stories on this DVD are presented at a slow pace for beginning readers. As students practice, they also work on fluency by singing along with songs about the stories. These sections are so fun students want to use them again and again. A bonus section presents the stories at a normal pace to help students learn to read fluently. Rock ‘N Learn Phonics Volume 2 DVD is perfect for students after they’ve mastered the material on Volume 1. With Phonics Volume 2, students discover other ways besides “silent e” to make long vowels, such as: ai, ay, ee, and ie. They practice long vowel patterns and apply phonics rules by reading sentences with words that feature long vowel sounds. Busy parents appreciate an approach that’s easy for students to use on their own. These DVDs differ from complicated kits that require a lot of time to understand and figure out before being used. You won’t find a phonics video program more thorough and entertaining than Rock ‘N Learn Phonics DVDs. Kids are thrilled to work with the phonics video segments again and again. They take pride in their accomplishments as they build skills and boost their confidence. Rock ‘N Learn Phonics is perfect for regular education, special education, remedial classes, ESL, and even adult basic education. By covering a variety of skills at different levels, our phonics DVDs provide an effective tool for differentiated instruction in the classroom. Students at different abilities will find content that challenges and motivates them to master new skills. Some teachers use Rock ‘N Learn Phonics to facilitate individual instruction. While the main group is using Rock ‘N Learn Phonics, teachers can work with those students requiring extra attention. Plus, these phonics videos help students learn to speak English and really hear the sounds involved. Rock ‘N Learn DVDs work great with any DVD player, computers with DVD players, projection screens, and interactive white boards. Some software kits for interactive whites boards allow teachers to stop the lesson and add their own content to the lessons on our phonics DVDs. Nationally acclaimed children’s educational DVD series Rock ‘N Learn received top honors from three of the parenting community’s most prestigious organizations for the company’s recently released Phonics DVD titles, including Parents Choice.org, the National Parenting Seal of Approval and Mom’s Best Award for Best Products of 2010. Rock ‘N Learn can be found in top school supply and specialty stores nationwide (the full list can be found at http://www.rocknlearn.com/html/find_a_store.htm) as well as Barnes & Noble’s education DVD section, Amazon.com and the company’s own Website (www.rocknlearn.com). 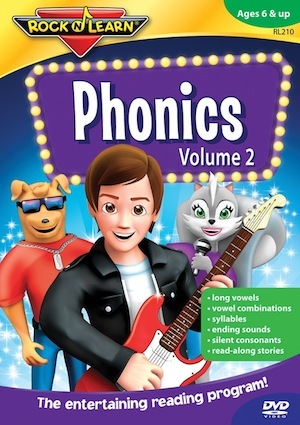 Rock N Learn Phonics Volume 1 and 2 retail for $19.99 each. 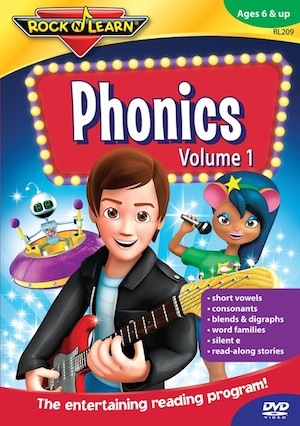 ONE winner will receive both Rock N Learn Phonics Volume 1 and 2. To enter leave a comment on this post telling me who would use this if you won and what skill you hope it will help improve. US addresses only please, no PO Boxes. This contest will end on Saturday 10/23/10 at 11:59 pm est. If you’ve entered any of my giveaways before then you know that only comments containing all of the requested information will be eligible for entry. The winner must contact me to confirm they wish to receive the prize within two days of my email notifying them they’ve won. Good luck to everyone! This would be great to win for my granddaughter. I hope it helps her with syllables. I would love to win this for my granddaughter, to help her with her vowel sounds! forgot my tip on Halloween, Our rule is they have to have an adult with them all times! My nephew could use this to learn how to read and speak properly. This would be fun for my 3 year old daughter. She is sounding out the 1st letter of words, so I know this would help her with that! I use the Rock N Learn videos in my special ed classroom. My own twins are turning 4 next month and are very excited about learning to read and spell so I’d love to use these with them, too! We homeschool our two kids (4 & 6) and both are learning how to read. We teach phonics over sight words, and I’m always looking for media (DVDs and CDs) to help teach to give them a varied approach. We’d love to win! My son is obsessed with music. This would be a GREAT way for him to learn phonics. My 9 y-o struggles with reading. We would use this with him. He has a hard time with phonetics and I have tried various products to enrich his skills in reading. I would give this to my nephew. His is in kindergarten and this would help him with his speech and reading. He loves to read book and loves movies like this so I know that he would love this.